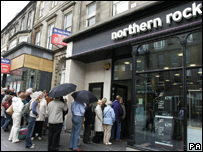 Will there be more queues outside Northern Rock on Monday? People with accounts at the Northern Rock have withdrawn almost £2bn since Friday, the BBC's business editor Robert Peston has learned. And the firm is bracing itself for more withdrawals in the coming days. It is also understood that Northern Rock nearly sold itself to rival bank Lloyds TSB, before seeking emergency funding from the Bank of England. However, the deal fell through because of the difficulty of borrowing money in the current financial climate. Northern Rock chief executive Adam Applegarth told the BBC the bank faced a "hard slog" but was sure the brand would recover. However, he would not confirm how much had been withdrawn. He said he was "absolutely confident" that his customers' money was safe, but that they were welcome to withdraw it if they wished - and that branches would open early on Monday to deal with expected demand. The BBC's business editor said the £2bn withdrawn - which represents about 8% of the £24bn deposits it held on Thursday - was actually less than the mortgage lender and officials at the Bank of England and Financial Services Authority had feared. However it cannot be certain whether much more will be withdrawn in the coming days, especially from holders of Northern Rock's postal accounts - which contain about £10bn. Mortgage banks and building societies such as Alliance & Leicester and Bradford & Bingley, as well as the bigger banks, have seen much of the money withdrawn from Northern Rock, Mr Peston said. This suggested there did "not appear to have been a loss of confidence" in other firms. "Although the risk of contagion has not been eliminated, so far there is no great sign of it," he added. The City watchdog, the Financial Services Authority (FSA), has backed comments from the Treasury, saying it is confident that the Northern Rock is solvent and that savers could continue to deposit and withdraw funds. "To be absolutely clear, if we believed that Northern Rock was not solvent, we would not have allowed it to remain open for business," FSA chairman Callum McCarthy said. The BBC has also learned that two banks were very interested in acquiring the beleaguered firm. However, they were concerned about doing such a big deal amid turmoil in money markets and when it was difficult and expensive to raise money from other banks and financial institutions. Mr Peston said that Lloyds TSB came closest to buying Northern Rock, but that the bank says it is not interested in a deal - for now. The Bank of England has told our business editor that the emergency lending facility offer to Northern Rock would be transferred to any new owner. However once the facility expires - and the Bank will not make the expiry date public - there is no guarantee it would be extended for the new owner. "Most bidding banks will remain nervous about taking on a balance sheet of Northern Rock's size with the risk hanging over it of needing to refinance a large chunk of loans from the Bank of England at short notice in markets which may remain frozen," Mr Peston said. Northern Rock's realisation that selling the bank had become impossible in current market conditions, persuaded the board to approach the Bank of England and ask for access to emergency loans, Mr Peston said. "Plainly, a takeover would have been a less humiliating option. But it just couldn't be done." Northern Rock's chief executive Mr Applegarth admitted that the firm may become a takeover target, after its shares fell by 32% on Friday. "You have got to be more vulnerable (to a sale) if your share price has come down," he said. "It's up to bidders to make a bid." Observers say that besides market conditions, other leading UK banks were unlikely to be falling over themselves to buy the troubled lender. Besides the costs and difficulty of borrowing money, there is a feeling from some that its name has been tarnished by its need to call on the Bank of England for a bail-out. Many of its mortgage customers are paying low rates of fixed rate loans and so are likely to move elsewhere - meaning rivals will instead focus on attracting that business, analysts say. The fact that there is little room seen for cost-cutting at the firm, and that it does not have a vast network of branches also work against it, according to observers. Justin Urquhart Stewart, of Seven Investment Management, said that Northern Rock now had a limited future. "I expect that in a year's time, Northern Rock will not exist," he said. "As a brand it is shot. The question will be who will own it. It is a great shame. A perfectly good business will be strangled by circumstances." The bank has struggled to raise money to finance its lending ever since money markets seized up over the summer. Unlike most banks, which get their money from customers making deposits into savings accounts, Northern Rock is built around its mortgage business. It raises most of the money which it provides for mortgages by borrowing from banks and other financial institutions. WHAT'S HAPPENING AT NORTHERN ROCK?